Reposting my artist interview from Maker Mentors Art Sale now that the sale has ended. New purchase options are at the bottom of this post. Because everyone kept telling me I wouldn’t make a living as an artist, I took a degree in scenery design for theatre with plans to become an Art Director for feature films. I loved theatre and film and thought I’d make a career there, but things turned out differently. I had a brief career coloring comic books and then fell into the Dot-Coms in California beginning a 20-year career in digital new media, graphic design, and animation. I made a living. I’ve been creating as an artist ever since I could finger-paint with my mashed peas and pureed chicken. I’m not sure I ever wanted to be an artist. I think it was always just been what I am. It’s how I move through and deal with the world. Bad things happen, good things happen, and I’m driven to create. What is the name of your piece featured in our Art Sale? What inspired the piece featured in our Art Sale? I’ve been following the work of a group called The Peace Factory for many years. Their aim is promoting peace, mainly in the Middle East, through grassroots approaches based on the idea that when people get to know and understand each other and are no longer nameless, faceless statistics, they can find care, common ground, and perhaps friendship and peace. In recent years, the ancient, mystical symbol of protection claimed by everyone in the region, the Hamsa (which means “five” in Arabic), has also begun to be used as a symbol of peace and friendship. 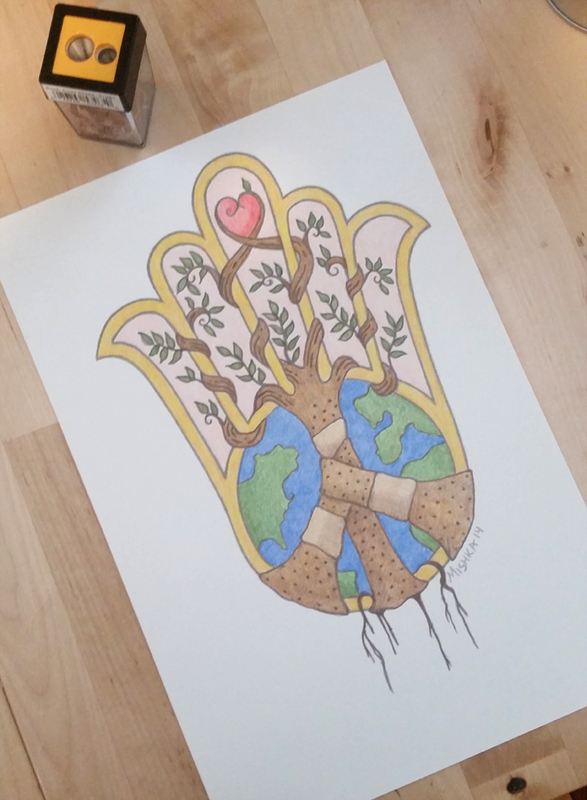 The original concept for my Hamsa is also based in the Jewish principles of Tikkun Olam – Heal the world. It is my sincere hope that someday when the children of Israel and Palestine come together in peace, the rest of the world may follow. Can you talk about the process you used to create it? I started with a fairly detailed sketch then scanned it into the computer to clean up and enlarge. I then printed it out very lightly on art paper and applied the color pencil. I scanned that back into the computer and did some digital touch-ups. I like to think I’m a happy, friendly, outgoing person. That probably comes out in my bright color and subject choices. Even my moody pieces are accessible. How do you decide what subjects to include in your art? I like my pieces to tell a story, so I tend to do a lot for children. But I also really like to draw food! I am also a spiritual person, so that comes out in my work. I work a lot in the themes of female empowerment, yoga, some history and fantasy, and Jewish spirituality. What do you love most about creating and being an artist? What I love most about being an artist is the control I have over the little worlds I create — each little image in each little story. I can create vignettes and slices of life the way I want them to be. Having a creative outlet helps me to get through the things I can’t control in my life. Art has the power to change and influence people’s moods and how they relate to the world. If I have that power at all in my work, I’d like to think I use it do to good. I would love to make my income solely off my art. I’m working in that direction. I don’t think I’ll ever stop creating. And, of course, I’d like to continue living a reasonably happy, healthy life with the possibility of being a grandmother someday. What are you doing when you are not creating? Do you have other hobbies? I’m always creating—even within my hobbies, and they have a big influence on my art. I enjoy cooking, baking, and my yoga practice. I’m also a huge history nerd. I love historical fiction in books and on TV. That being said, I have two small children at home, so I’m limited to what I can make time for. Do children count as a hobby?